If you know anything about eating out in London it can’t have escaped your notice that MEATliquor, MEATmission and MEATmarket have been steadily popping up and expanding across the London restaurant scene for a little over a year now and I have finally jumped on the MEATwagon… (also the name of the food stall that started the whole thing). Covent Garden’s MEATmarket is the newest member of the family and as such is the first of the restaurants to adopt a casual takeout/fast food format. I think this is a genius move considering the infamous queues that regularly form outside the original Welbeck Street MEATliquor restaurant… partly due to their no bookings policy (and who doesn’t have one of those these days!). MEATmarket has a very informal concept, not a restaurant as such, more of a fast food outlet with benches if you should happen to wish to eat in. Whilst a Covent Garden location, MEATmarket isn’t in the central square with all the pretty high end shops, it’s located on a balcony hovering over the Jubilee Market Hall, giving the whole thing a much more industrial feel with the bustle going on below and the heavy clear plastic warehouse curtains separating you from the main hall. The narrow corridor of a restaurant isn’t exactly subtly decorated, bold lit up signs hang from the ceiling either yelling instructions at you ‘NO QUEUE JUMPING!’ and ‘ORDER HERE (NICELY! )’ or featuring witty captions and quotes to keep you amused while you wait. We went for an early dinner just after six but I imagine a bit later on or at lunchtime the queues must start descending down the staircase in the outer corridor, which is somewhat reminiscent of an old school building. When you get onto the main balcony that is the restaurant, everything is very much in your face: noisy open kitchens, as you would expect in any takeout, loud decor and the menu plastered on the wall in front of you. Shamefully I have to admit, having read so many reviews, I’d already decided what I was having before I got there (I really should get out of this habit, it spoils the fun a bit) but pretty much all of it sounds juicy, meaty and extremely appetising. I went for the Dead Hippie burger and my friend Stuart had a Philly Cheesesteak, we ordered a side of chilli cheese fries and jalapeño poppaz to share and a couple of vanilla milkshakes to wash it all down. The waiter took my name and we took a seat on one of the benches over looking the market place. Within a couple of minutes he brought our shakes over (I gather this was just because it was quiet as later on they were calling out names to collect at the counter over a loud speaker). The shakes were quite small, but I think this a good thing as the bucket like cups you get served in some places fill you up way too much. They had a good vanilla flavour, not weak and wishy washy at all and there was a hint of something I can’t quite put my finger on that made it taste a bit like molten marshmallows. Less than five minutes later our food arrived on classic fast food style trays with paper wrappings, bright, colourful and inviting. Every bench has a large bottle of ketchup, mayo and mustard so no faffing about with piles of fiddly sachets and at first I laughed at the whole roll of kitchen towel provided… however it turned out this was a pretty good call. The burger consisted of two thin patties with cheese, pickles, onions, lettuce and ‘dead hippie’ sauce all sandwiched in the middle of a soft white bun. There’s no doubt about it, this burger was JUICY to the max. It’s completely impossible to eat without making an absolute mess of yourself, but don’t get me wrong, this is a great thing. 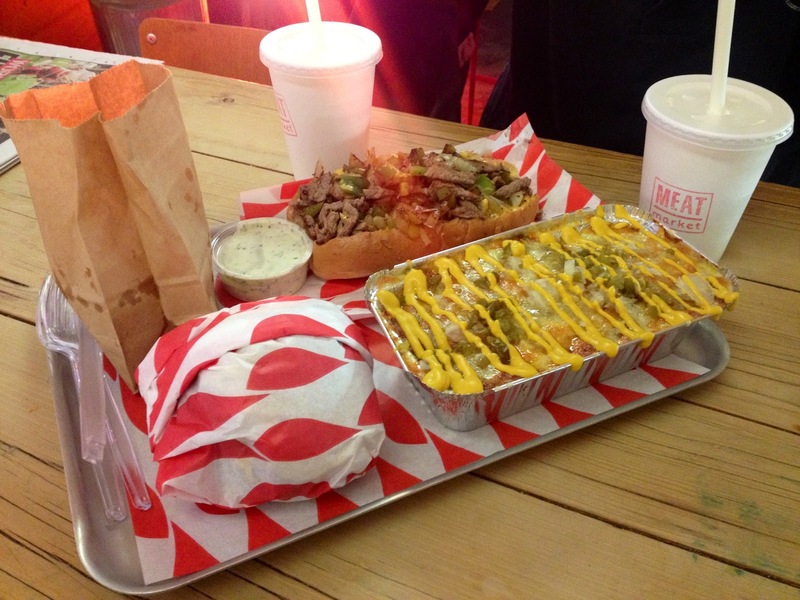 Who wants to look all neat and tidy whilst chowing down on an enormous burger anyway? Surely that would defeat the object. I personally would prefer to have one thicker patty in the burger as I found the thin ones were cooked slightly more than my preference and I think a thicker one would be much more flavoursome and meaty cooked to a juicy medium rare. I’m guessing this is the fast food effect on the burger though, it’s easier to knock out two thin burgers quickly than to cook a thicker one to each customer’s liking. 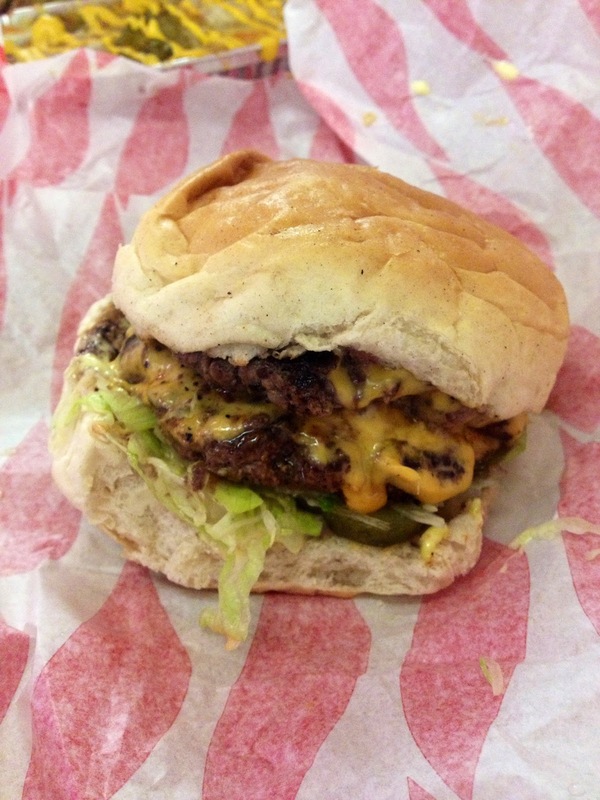 I’ve never visited any of the other restaurants but I gather they use a thicker patty and I would expect a slightly higher standard of burger at MEATmission and MEATliquor given that they are proper restaurants rather than takeaways and presumably would allow more time in the preparation. This was still an awesome burger though, absolutely brilliant for such fast food. The highlight ofmy evening was by far the jalapeño poppaz! Expecting to bite into a whole pepper stuffed with cheese, I was surprised to discover the jalapeños were diced up into the cheesy gooey mixture before being coated in the crispy breadcrumbs. These were an absolute delight. I know a lot of people are scared of jalapeños and think they’re too hot and these ones certainly had a kick but they won’t blow your head off so don’t be scared to try. They also come with a cool ranch style dip to take the edge off if you really can’t handle the heat! 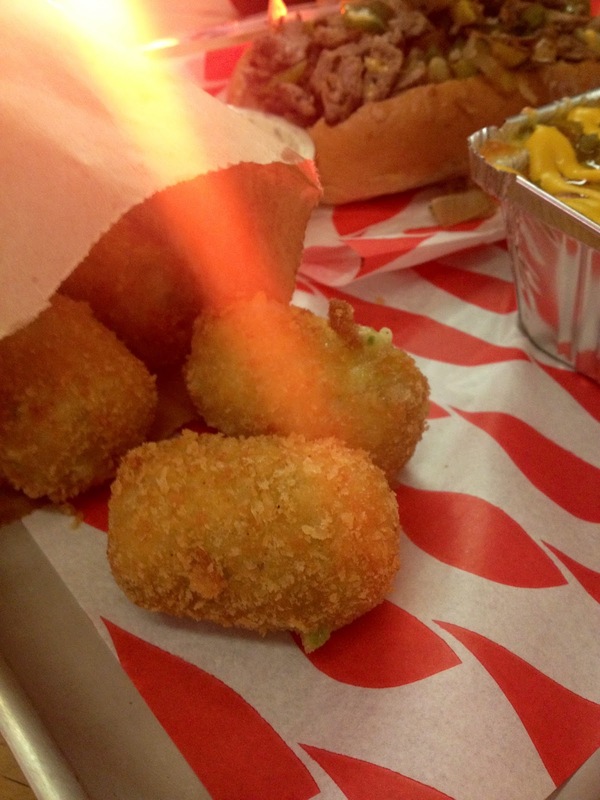 Crispy, gooey, hot and cheesy… could you really ask for anything more? 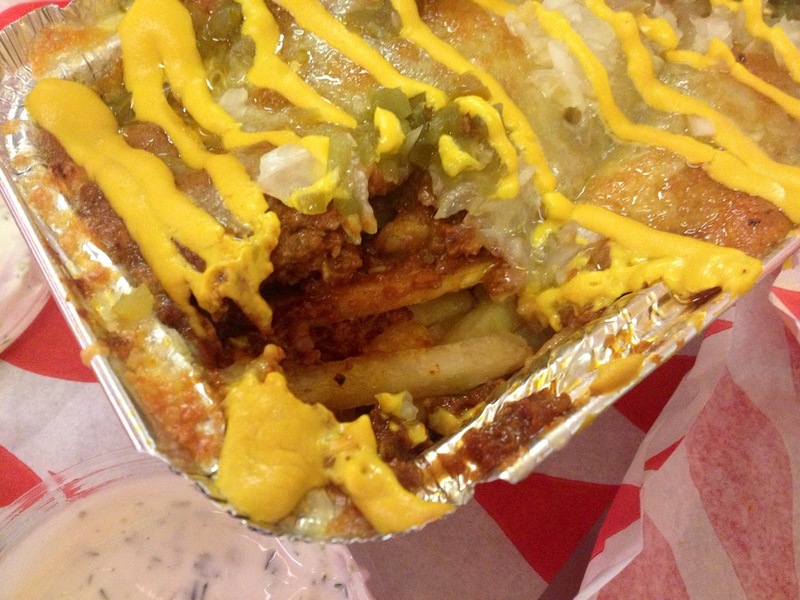 I think the chilli cheese fries were my least favourite aspect of the evening. They’re not a side I’d usually opt for but we decided to pick a side each and these were Stuart’s choice. A really tasty dish, the topping was spicy and meaty but I think its downfall was that there was just a bit too much topping really. Having this dish as a side with a burger or hot dog, I don’t think you need so much meat. As shown above, there were some fries buried deep in there somewhere but I’d have rather had a portion of fries with some chilli on top rather than a portion of chilli with a few fries underneath. 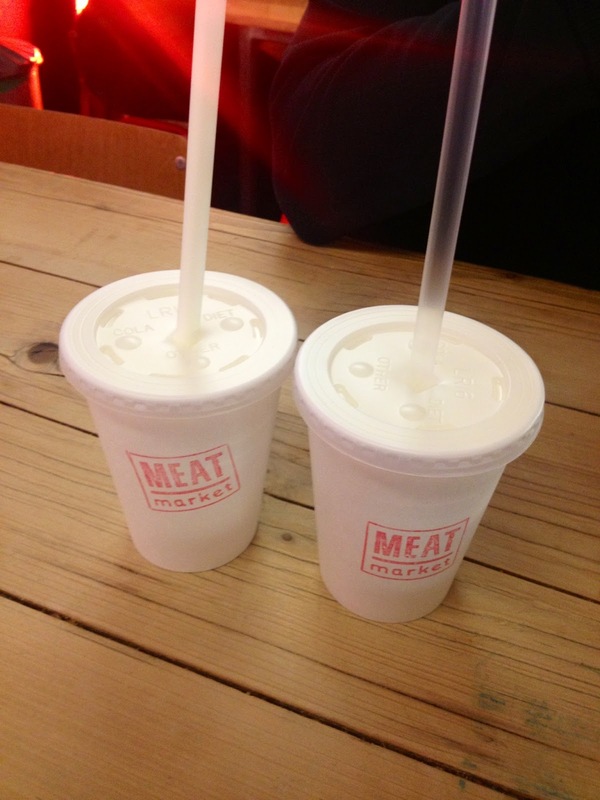 Overall I really enjoyed MEATmarket. 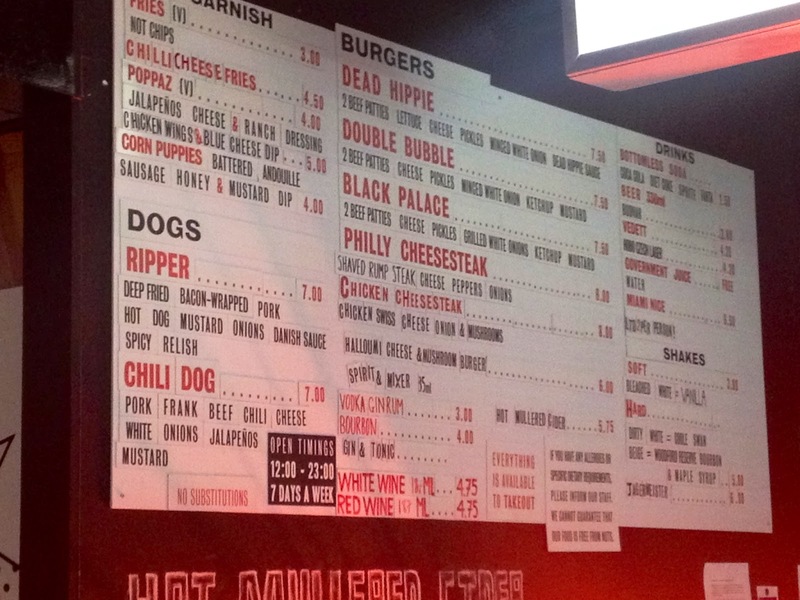 I absolutely loved the retro takeaway burger joint concept and the unashamedly in your face, satisfyingly meaty food, I’ll definitely be heading back here to try one of the other burgers or maybe a hot dog, I don’t think I’ll be able to resist having the poppaz again though! Having tried out MEATmarket I’m now really keen to visit one of the other restaurants as I’d expect the food to be stepped up a notch and I’d like to see how the different formats work in comparison to the fast food version. 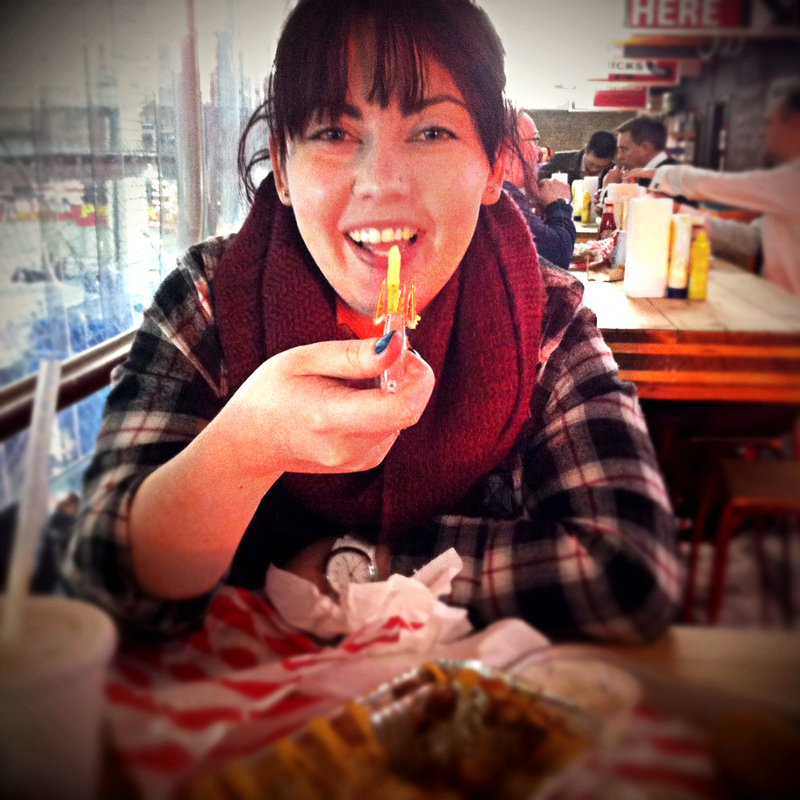 Cheesy snap of me caught munching!